The Virginia Museum of Fine Arts has recently completed a year-long project to conserve, stabilize, and digitize 60 works on paper from the Ludwig and Rosy Fischer Collection of German Expressionist Art. The conservation efforts were made possible by a grant from the Bank of America Art Conservation Project. VMFA was among only thirteen institutions selected in 2015 to receive funding from the Bank of America Art Conservation Project, which seeks to preserve culturally significant works of art from around the world. “Our Art Conservation Project is designed to not only conserve artworks and shine a light on the need for the preservation of artistic and historic treasures, but also to educate communities, and convey respect for the varied cultures and traditions throughout the world,” said Victor Branch, Richmond market president, Bank of America. Works by key German Expressionists—Max Beckmann, Peter August Böckstiegel, Otto Dix, Conrad Felixmüller, Erich Heckel, Ernst Ludwig Kirchner, and Emil Nolde—have received complete restoration as part of the project. The first selection of newly restored pieces—seven works on paper by Ernst Ludwig Kirchner—have recently opened in the museum’s European Modernism Galleries. The Ludwig and Rosy Fischer Collection has garnered national and international attention, standing among other noteworthy holdings of German Expressionist art at the Museum of Modern Art (New York), the Los Angeles County Museum of Art, and the Saint Louis Art Museum. The Fischer Collection also represents an important asset to the academic communities based in Richmond. These newly preserved works will join those already on display, further strengthening a collection that provides countless learning opportunities for both scholars and the general public. Known for containing many significant examples of Die Brücke, the Fischer Collection’s evolution reflects the history of early 20th-century Europe. Between 1905 and 1925, Ludwig and Rosy Fischer of Frankfurt, Germany, amassed a collection of art created by a group of radical young artists. The forward-thinking couple acquired examples of German Expressionist paintings, sculpture, drawings, prints, and illustrated books, but their collection did not survive the Third Reich intact. Upon their deaths in the mid-1920s, the collection was divided between their sons, Max and Ernst. In 1934 as the Nazi party gained power, Ernst and his wife Anne left Germany for the United States with their half of the collection packed among their household goods. The couple settled in Richmond where the art was preserved in their home for more than 70 years. When Max Fischer fled Germany a year after his brother, he had to leave his portion of the collection behind and it was presumed lost, stolen or destroyed during World War II. In 2009, the Ludwig and Rosy Fischer Collection of German Expressionist Art became part of VMFA’s permanent collection. Through a gift-purchase agreement with Anne Fischer (1902-2008), the widow of Ernst (1896-1981), the museum acquired approximately 200 works from one of the 20th century’s most significant movements. Earlier this year, Ernest Ludwig Kirchner’s Sand Hills in Grunau (1913)—one of the paintings from Max’s portion of the collection that had been presumed lost—was returned to the Fischer family and acquired by VMFA through a gift-purchase agreement. With works dating just before World War I through the 1920s, the collection has a strong emphasis on Die Brücke—“the Bridge”—a pivotal movement within German Expressionism. Responding subjectively to the changing world around them, members of Die Brücke often used distorted forms and a vivid palette of bold colors. Printmaking was also a central practice for German Expressionists; woodcuts, etchings, and lithographs allowed wider distribution and accessibility of their work. As a founder and leader of the Die Brücke movement, Kirchner developed a particularly expressive style with woodcuts. The handwritten notes addressed to Herr and Frau Fischer on the bottom of many of the Kirchner prints in the museum’s collection attest to his personal relationship with the Fischer family. The Fischers owned more paintings by Kirchner than any other artist, and his work, including the exceptional group of prints on display now in the first installation of works conserved with funds from the Bank of America grant, form the core of their collection. 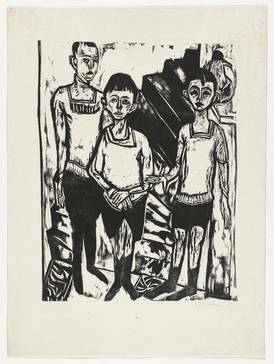 One of the woodcuts included in this group, Three Boys, Fehr's Sons, 1915 was likely based on a painting Kirchner made of the same subject, which Ludwig and Rosy Fischer also acquired. However, it was among the paintings that Max Fischer left behind when he fled Nazi Germany in 1935, and it remains lost. Bank of America’s Art Conservation Project provides grants to nonprofit museums to conserve historically or culturally significant works of art, including works that have been designated as national treasures. Since 2010, Bank of America has provided grants to museums in 28 countries for 85 conservation projects. Works conserved in 2015 include a marble figure of the Buddha Amitābha (585 C.E. Sui dynasty)at the British Museum, London; four paintings and one mural at the OCA Museum, São Paulo; Uemura Shōen’s Jo-no-Mai (Noh Dance Prelude) at The Tokyo University Art Museum and Manet’s Woman in Evening Dress at the Guggenheim in New York. VMFA’s grant supported the physical and chemical stabilization, as well as digitization, of works by seven key artists in the Die Brücke movement. The Virginia Museum of Fine Arts (VMFA) in Richmond, Virginia, is one of the largest comprehensive art museums in the United States. VMFA, which opened in 1936, is a state agency and privately endowed educational institution. Its purpose is to collect, preserve, exhibit, and interpret art, and to encourage the study of the arts. Through the Office of Statewide Partnerships program, the museum offers curated exhibitions, arts-related audiovisual programs, symposia, lectures, conferences, and workshops by visual and performing artists. In addition to a wide array of special exhibitions, visitors have the opportunity to experience the museum’s global collection of art that spans more than 5,000 years. VMFA’s permanent holdings encompass more than 35,000 artworks, including the largest public collection of Fabergé outside of Russia, the finest collection of Art Nouveau outside of Paris, and one of the nation’s finest collections of American art. VMFA is home to important collections of English silver and Impressionist, Post-Impressionist, British sporting, and modern and contemporary art, as well as renowned South Asian, Himalayan, and African art. In May 2010, the VMFA opened its doors to the public after a transformative expansion, the largest in its eighty-year history. The Virginia Museum of Fine Arts is the only art museum in the United States open 365 days a year with free general admission. For additional information, telephone 804-340-1400 or visit www.vmfa.museum.